A Trio Of Burgers | DidjaEat? There are few things I love more then a good burger. The more combos the better. Recently, I have had some interesting burgers and, while it took me awhile, I am gonna show you them now. The Grey Lodge had, in the past, really disappointed me with a really nasty cheesesteak. Well, with their new chef Eric, they seem to be turning this around. They now make almost everything in-house, which is refreshing. It is so easy to trot down to Jetro in South Philly and load up on frozen burgers, fries and munchie food. It takes balls to step out of that shadow and stretch the boundaries of bar food, especially in Mayfair, where people are used to Chickie’s and Pete’s frozen crinkle fries. They have some neat stuff on the menu, including a tasty Cuban sandwich I had one day. But the burgers are pretty good. You first figure out if you want the burger, then pick what kind of cheese from about 6 and then go to town customizing it. 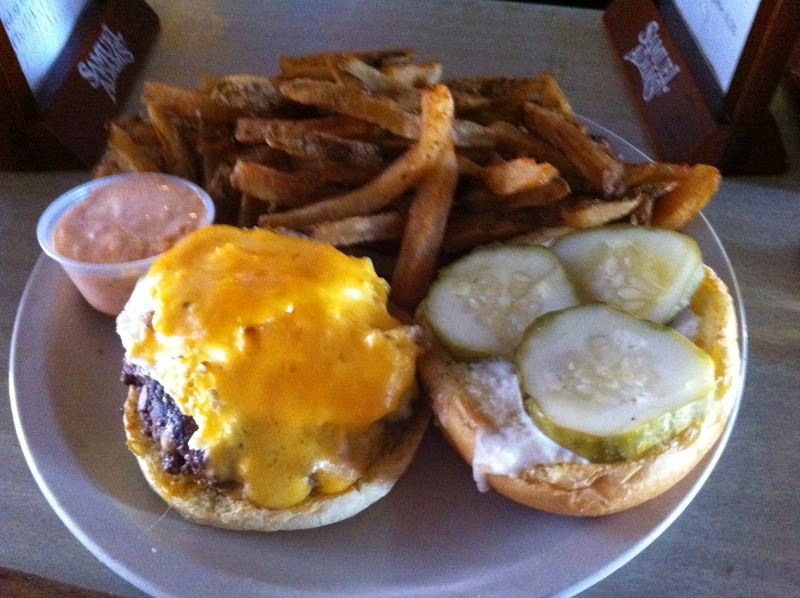 The burger you see above has mayo, cheddar cheese, a fried egg and pickles. The pickles are sliced deli pickles, which is a nice touch and added a nice crunch to the whole package. The bun was fresh and the egg was, well, an egg on a burger is always a great touch. The fries were fresh, hot and overflowing. I hate it when they skimp on fries. I ordered the spicy mayo to dip in and it did not disappoint. It was spicy without your face on fire and I even found myself trying to dip my burger in it too. Overall, the burger was about 12 bucks, which might seem pricey but the base burger is 8 bucks. So, that’s about reasonable. I am super excited about the food at The Grey Lodge on the upswing. They have fantastic beers and now they have food that’s catching up. Go check it out! PYT is a burger bar joint in the Piazza. They have a burger of the week and this was one awhile back. It’s a burger with cheese and bacon that is basted in a Jack Daniels sauce. Also on this thing are fried pickles. 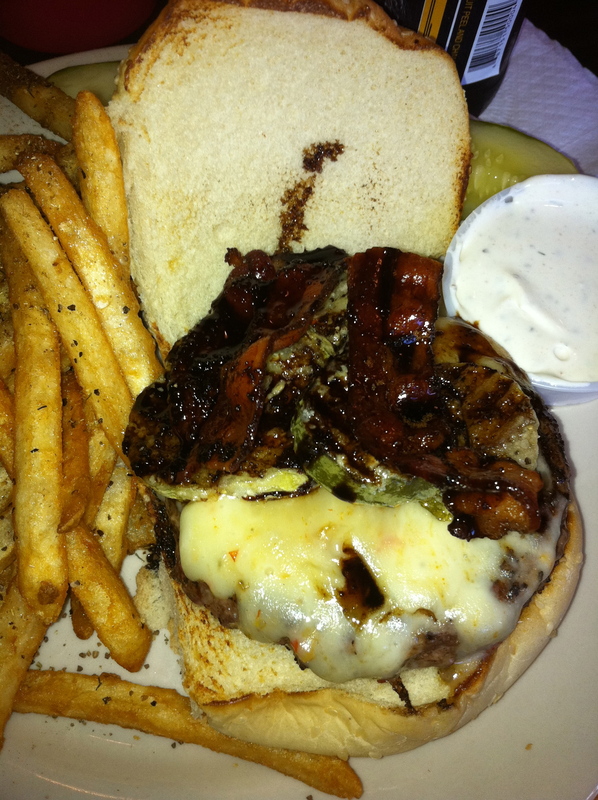 You would think the bacon would make this burger but the fried pickles actually sneak in and steal the show! Also stealing my heart is the dill mayo dipping sauce for the fries. It is subtle and dances in your mouth when it mixes with the fries and the grease. If I could, I would have swam in a vat of it. Yes, I have no shame. This burger here I almost did not order. I originally ordered a chicken salad sandwich on whole wheat bread but the chef came out and told me they were out of it. So, I ordered this. Wow. 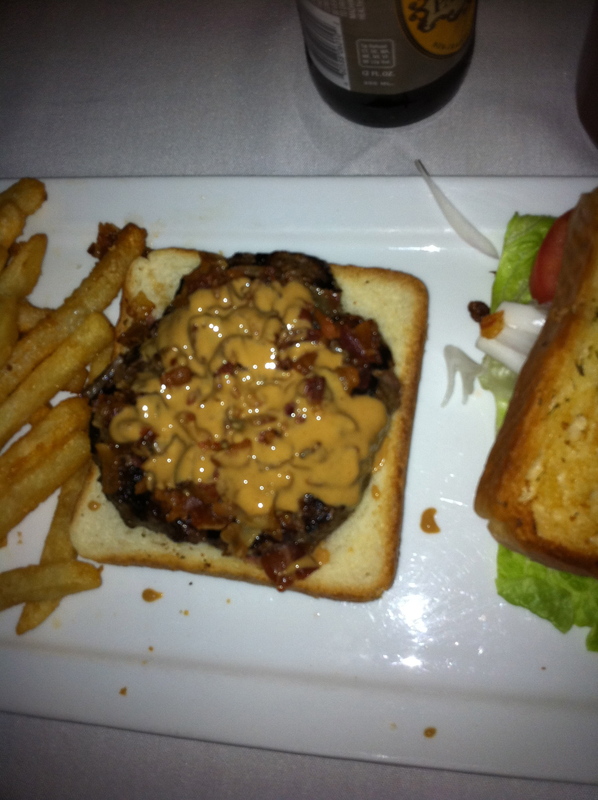 This, from Urban Saloon in Fairmount, is a burger with Peanut Butter and Bacon on Texas toast. While the fries were typical Jetro coated fries, the burger was pretty great! It was done exactly how I ordered it, medium, and the peanut butter was melted just enough to cover the burger but it wasn’t dripping down my arm. They are not skimpy with the bacon either, so extra mega points for that. The patty is a bit small but it does the job. Finally, I did enjoy a Yards Pale Ale with the burger, altho I prefer the Philly Brewing Co’s “Philadelphia Pale Ale”, but they don’t carry the PBC stuff there. Let’s get with the program Urban Saloon! Posted on June 6, 2011, in bar food, bars, burgers, condiments and tagged burgers, jack daniels burger, peanut butter and bacon burger, pyt, the grey lodge, urban saloon. Bookmark the permalink. Leave a comment.